The Volcanoes put on a show of hitting, pitching, and fielding June 28 to whip their Eugene visitors 7-3. Completing a three-game sweep of the Emeralds to reach a 10-4 record, Salem-Keizer prepared for a five-game series in Vancouver. Three of the Volcano runs came in the first inning. Kyle McPherson hit a one-out infield single, and David Villar followed with a two-run home run over the center field wall. After another out, Robinson Medrano was hit by a pitch for the fifth time this season and scored on a double to right center by Wander Franco. Keaton Winn pitched the first two innings for the Volcanoes, allowing no runs and striking out three. However, in a move manager Hector Borg explained after the game, he brought in Greg Jacknewitz to pitch the third inning. With two out in the top of the third, Luis Vasquez hit his first homer of the year, clearing the left field fence. Jacknewitz retired the next batter and stayed in the game through the seventh inning, allowing one more run, which was unearned. Salem-Keizer added three runs in the fourth. Kevin Rivera led off with an infield single and continued to second base on a throwing error by third baseman Ramsey Romano. Mikey Edie moved him to third with a sacrifice bunt. Jose Layer singled on a grounder to center, driving Rivera in. McPherson hit his first homer of the season, to right field, and the Volcanoes were ahead 7-1. In the Eugene sixth, Vasquez walked and moved to third on a double to center by Nelson Velasquez. An error by Layer in center field enabled Vasquez to score. Velasquez then stole third base on a call that brought protests from the stands and argument from Borg. Two were out by then, and Jacknewitz struck out the next batter. The last Emerald run came in the eighth. Matt Frisbee relieved Jacknewitz to start the inning and walked Fernando Kelli. In an attempt to pick Frisbee off, the throw went wild, and Frisbee went to second. With Jonathan Sierra at bat, Frisbee reached third on his 12th steal of the season. Sierra walked, and the runners pulled a double steal, Frisbee scoring the last run of the game. Jacknewitz was the winning pitcher at 2-1 with five strikeouts in his five innings. Jesus Tona pitched the ninth for Salem-Keizer. Eugene starter Ryan Williams went six innings and took the loss at 1-2. Sean Barry pitched the last two innings for the Emeralds. Despite their two errors, the Volcanoes made impressive fielding plays. Edie jumped to catch a fly to deep right field in the second. A double play, shortstop Rivera to second baseman McPherson to first baseman Franco, ended the game. Asked why he had pulled Winn after two games, Borg said he was testing the starting potentials of all his pitchers. “We’re doing a good job overall as a team, working on executing,” he added. Jacknewitz, asked what he was doing to pitch well consistently after being roughed up in his first game, said he was simply working on being consistent. McPherson, who has played both shortstop and second base for the Volcanoes, said he was comfortable at either position. He said he was not new to wooden bats, having used them in summer ball between seasons at James Madison University. The Volcanoes guaranteed a series win by whipping Eugene in the second of three games. Salem-Keizer took a 2-0 lead in the first inning on doubles by Diego Rincones and Trevor Abrams and a single by Robinson Medrano. The Emeralds tied the score in the fifth on an error, a double, and a single, but the Volcanoes answered with three runs in that inning. After two outs and singles by David Villar and Medrano, a walk to Ricardo Genoves, and an error, Mikey Edie singled them home. A wild pitch scored Genoves. In the Volcano seventh, walks to Medrano and Genoves and a single by Edie loaded the bases. Nico Giarratano doubled all of them home, reached third on an error, and scored on a single by Kyle McPherson. Eugene scored once in the eighth and once in the ninth. Norwith Gudino went six innings for his third win against no losses and had seven strikeouts. Faustino Carrera started for the Emeralds and took the loss for a 1-2 record. This was the roughest series start for Salem-Keizer so far. Vancouver pitchers held the visiting Volcanoes to two hits, one of them Diego Rincones’ third home run of the season in the fourth inning. Robinson Medrano had the other hit. The Canadians had 16 hits, including Brett Wright’s first homer of the season, which he hit with one runner on in the sixth. Three of Vancouver’s runs came in the second, five in the sixth. Will McAffer was the winning pitcher in relief with a 3-0 record. Volcano starter Miguel Figueroa, who lasted three innings, was the losing pitcher at 0-3. Of Salem-Keizer’s five pitchers, the only one to allow no runs was Keenan Bartlett, who pitched the last two innings. McAffer replaced starter Jordan Barrett in the fifth with the bases loaded and two out and retired the next batter. The Volcanoes lost their second game in a row in this five-game series. All the runs were scored in the first two innings. The Canadians scored once in the first inning, and Salem-Keizer responded with two runs in the second. After singles by Trevor Abrams and Robinson Medrano and a wild pitch by starter Josh Winckowski, catcher Christopher Bec dropped a third strike, letting Abrams score and Medrano reach third base. Medrano scored as Kevin Rivera grounded out. Vancouver then went ahead with two home runs, Bryan Lizardo’s first and McGregory Contreras’s fourth. Winckowski was the winning pitcher with a 1-2 record, and Cobi Johnson had his first save. Stetson Woods, who pitched the second through seventh innings, had five strikeouts but lost his first game against no wins. It took an extra inning, but Salem-Keizer showed Vancouver what the Volcanoes can do this year. Gregory Santos started on the mound for the Volcanoes and did not get the win but struck out six in his seven innings. Mack Meyer, who relieved him, went two innings and got the win for a 1-0 record. Jesus Tona had his third save. Reliever Juan Nunez was the losing pitcher at 0-1. Although the Canadians got more hits (11), the Volcanoes made better use of their nine hits. In the sixth inning, when they scored three of their runs, Kyle McPherson walked, went to second base on a single by Trevor Abrams, and scored on a single by David Villar. Villar reached second on a throw. Robinson Medrano singled Abrams and Villar home. 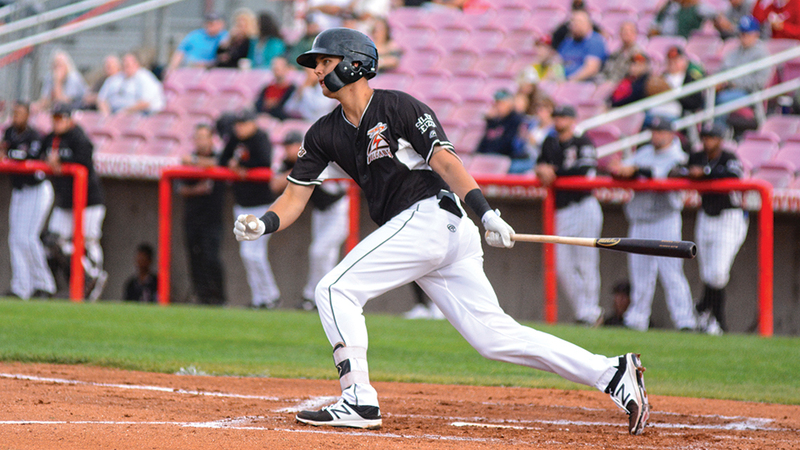 Medrano hit his fifth home run in the eighth inning with the bases empty. Vancouver guaranteed a win of the five-game series with this shutout, scoring all five runs in a fifth-inning rally. The Canadians outhit the Volcanoes only 7-6 but put five of their hits, including home runs by Brett Wright and Christopher Bec, together in the fifth. Norwith Gudino, Salem-Keizer’s starting pitcher, lost his first game against three wins. Vancouver’s Justin Watts was the winning pitcher in relief with a 1-0 record. The Volcanoes’ best offensive showing came in the seventh, when Wander Franco doubled with two out, sending Robinson Medrano, who had walked, to third base. A planned movie theater for Keizer Station isn’t happening. On Wednesday, June 27, Chuck Nakvasil, the owner of Keizer Cinema LLC, terminated a ground lease for property near the intersection of Chemawa Road Northeast and Keizer Station Boulevard effectively ending the bid to put a theater in on city-owned property. Nakvasil cited “substantially higher” bids for construction of the nine-screen complex as the reason for pulling out of the lease. The termination is permitted under the terms of a lease agreement with the city that was contingent on successful financing of the project. Nakvasil had to have a signed lease to apply for financing and confirmed bids to finalize the financing of the project. “We appreciated the opportunity to work with Mr. Nakvasil and his team and, though disappointed, certainly understand the business decision he was forced to make,” said City Manager Christopher Eppley. The termination of the ground lease ends a process that began in 2016 when a broker approached the city with a potential deal to lease the land and place a theater on the site. During the past two years, city staff and committees adjusted master plans and granted design variances to allow a theater to be erected on the property. The ground lease was signed in January 2018. At the time, city officials and the project designer expected the theater to break ground in March with an expected opening in time for the major movie push around the holiday season later this year. In recent months, access roads to the property and a cut-in for a new driveway were constructed as a shared expense between the city, Nakvasil and the owners of the adjacent property. Under the terms of the lease, Keizer would have collected about $144,000 in rent each year. For the first 20 years, the broker would get a 20 percent share of those revenues. However, the estimated $120,000 annual income would have gone a long way to offsetting payments the city has had to make into the Public Employees Retirement System (PERS). Keizertimes contacted Nakvasil’s lawyer for more information about the gap between the expected construction costs and the actual bids, but had not received a response at press time. The Keizer Station project was originally sold to the city with promise of a theater, but it has yet to materialize. 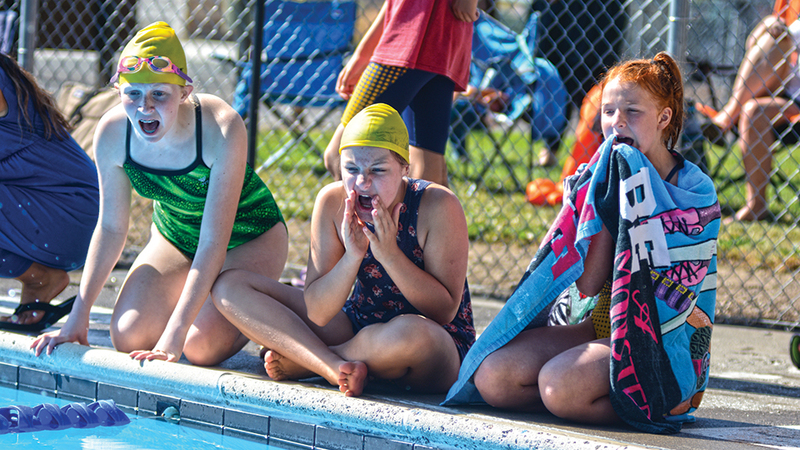 Holiday Swim Club knocked off defending all-city champion Northwood to open the season. Swimming at home on Thursday, June 28, Holiday outscored Northwood 263-247. Holiday swept the 8-and-under and 11-12 year old medley relays. Holiday also won the girls and boys 8-and-under freestyle relays as well as the 15-18 girls free relay. Individually, Kyra Norstrom led the Holiday girls, winning the 11-12 medley, butterfly and backstroke. Claire Hicks placed first in the girls 8-and-under free and breaststroke. Ella Gerig had the fastest times in the girls 9-10 free and breaststroke. Other 8-and-under girls winners were Holiday swimmers Kaiya Turner in the IM, Olivia Anderson in the fly and Avelyn Sparks in the backstroke. Erika Robinett took first in the 11-12 breaststroke. Jaelynn Love touched the wall first in the 13-14 fly and Kassy Winters won the 15-18 fly. Tessa Talento placed first in the 15-18 backstroke. Haley Vanderweed swam the fastest time in the 13-14 IM. Landon Gerig, Michael Hudgins and Carter Hollis led Holiday’s boys, each winning two individual events. Hudgins took first in the 8-and-under free and backstroke. Gerig had the fastest times in the 11-12 free and breaststroke. Hollis won the 13-14 fly and IM. Hollis won the 9-10 IM. Jacob Castronovo touched the wall first in the 8-and-under IM. Ozzy Arnold took first in the 8-and-under fly. Noah Williams won the 8-and-under breaststroke and Ryan Bethers placed first in the 13-14 backstroke. Paris Boyd, Brooke Junker and Bryce Junker led Northwood last Thursday. Boyd won the girls 15-18 IM, free and breaststroke. Brooke took first in the girls 13-14 free, back and breaststroke. Bryce swam the fastest times in the boys 15-18 free, fly and breaststroke. Grant Woodard won the boys 9-10 fly and breaststroke. Tate Woodard took first in the boys 11-12 fly. Molly Eisele had the fastest time in the girls 11-12 free and Gavin Eisele won the boys 13-14 free. Meili Skipper took first in the girls 9-10 IM and Caleb Skipper won the boys 11-12 backstroke. Grant Schaffer swam the fastest time in the boys 11-12 IM and Caedmon Christensen touched the wall first in the boys 9-10 free. Evelyn Hales won the girls 9-10 fly. Jasmine Hills took first in the girls 9-10 backstroke and Eric Olsen swam the fastest time in the boys 13-14 breaststroke. Northwood also won both 15-18 medley relays, the 9-10 girls medley relay, both 11-12 free relays, the 15-18 boys free relay and the 9-10 girls free relay. Wally Mull, husband, father, brother, grandfather, and friend, passed away unexpectedly on Tuesday, June 26, 2018. Wally was born in Salem, Oregon, in 1946 and graduated from North Salem High School in 1964. After graduating from high school, Wally attended Oregon College of Education, while playing golf for the school. In 1965, Wally enlisted in the United States Air Force and served during the Vietnam War, stationed in Biloxi, Mississippi and Goose Bay, Labrador. With the ranking of sergent, Wally was discharged from the Air Force in 1969 and returned home to Keizer where he began working with the Keizer Water District in May 1969. Wally married Carol O’Connor in December of 1969 and they settled in Keizer raising their two daughters, Keely and Karlye. While working for the Keizer Water District, Wally also served as a volunteer firefighter at the Keizer Fire Department, was a member of the Keizer Elks Club, and helped coach Babe Ruth baseball. An avid sports lover, Wally would go on to help coach both his daughters and their friends in the Keizer Little League, and AAU Basketball. Wally was an instrumental influence in the growth of the Keizer Water District, seeking to develop the city’s own source of water for the citizens of Keizer. He served as the Keizer Water District Water Superintendent beginning in 1983 and in 1985 when the City of Keizer took over the Keizer Water District, Wally became the Public Works Superintendent. Upon the retirement of Jim Nightengale, Wally became the Public Works Director, also serving as Co-City Manager from 1997-1998, and then City Manager from 1998 until his retirement from the city in July 2000. During his 31 years of service to the Keizer Community, Wally will be remembered for his leadership and civic spirit. After retiring in 2000, Wally and Carol joined their daughters in Las Vegas, Nevada. Not one to rest, Wally began working at the MGM as a valet attendant. He loved staying busy and enjoyed meeting new people as well as running into old friends. Once again, Wally served as a mentor to the young men and women he worked with, who respected his advice and positive outlook. In addition to working at MGM, Wally enjoyed spending time with his daughters, as well as his grandchildren, Jordyn and Caden Carlin, and his extended grandchildren via the Summers family, McKenna, Addie, Regan, Bodie, and Afton. Holding fond memories of his home in Keizer, Wally kept his Oregon Duck football tickets and traveled with his grandson Caden to a few games each fall. He would also spend one week each August in the company of his brother Danny, sister Pam, and their families, playing golf and catching up with family and friends. Wally was preceded in death by his loving parents, Orville and Jeanne Mull, and his sister, Pam Mull-Dunz. He is survived by his wife Carol, brother Danny Mull, daughters, Keely Carlin and Karlye Mattie, and his grandchildren. A Celebration of Life will be held on Friday, August 3, 2018, at 5 p.m. at Keizer City Hall. In lieu of flowers, please donate to the Alzheimer’s Association at www.alz.org.